Join Chief Executive and peer CEOs on December 6, 2012 at the New York Stock Exchange for the 13th annual CEO2CEO Leadership Summit. The CEO2CEO Leadership Summit combines panel discussion by CEO leaders and industry experts with intimate roundtables and working sessions that challenge your assumptions, spark new ideas, and allow you to absorb and consider suggestions and solutions from peer CEOs. Consult individual program for session information. 5:10 – 5:30pm Winning Ideas from toay’s sessions: "What works for me." Douglas Oberhelman  Chairman, CEO and Director, Caterpillar Inc.
Doug Oberhelman was elected Chief Executive Officer and a member of the Board of Directors of Caterpillar in July of 2010, and became chairman effective November 1, 2010. Doug has led the company to record growth in income and sales over the last two years, income increased 83 per cent in 2011 to $4.9B, while completing several strategic acquisitions. Doug joined Caterpillar in 1975 and has held a variety of positions with the company, including senior finance representative based in South America for Caterpillar Americas Co., region finance manager and district manager for the company’s North American Commercial Division; and managing director and vice general manager for strategic planning at Caterpillar Japan Ltd. (CJL) – Tokyo, Japan. Doug holds a BA from Millikin University. David C. Novak  Chairman, President and CEO, Yum! Brands, Inc.
David C. Novak became Chairman of the Board and Chief Executive Officer of fast-food giant Yum! Brands in 2001, with 36,000 restaurants in 117 countries under brands such as KFC, Taco Bell and Pizza Hut. Novak shapes the company’s overall strategic direction, including its four key growth strategies, and devotes much of his time each year to personally train leadership skills to the company’s management and franchisees. Novak also held senior management positions at Pepsi-Cola Company, including Chief Operating Officer, and Executive Vice President of Marketing and Sales. Novak received the national 2008 Woodrow Wilson Award for Corporate Citizenship. Nick Akins is President, Chief Executive Officer and a Director of American Electric Power. Under his leadership the company has striven to increase long-term shareholder value and prepare the company for a competitive electricity market through capital investment and acquisitions. Nick rose through the ranks at both AEP and the former Central and South West Corp. (CSW). Prior to being elected president of AEP in December 2010, he served as Executive Vice President – Generation from 2006 through 2010.. Before CSW’s merger with AEP, Akins held various director and manager roles with responsibility for mergers and acquisitions, industry restructuring, fuels, system dispatch operations and system planning. Akins holds a BA and a Master’s Degree from from Louisiana Tech University. Doug Conant retired from the Campbell Soup Company in 2011, after a decade of leadership in which the company’s sagging market share was reversed to a stellar rebound and employee engagement went from among the worst in the Fortune 500 to being consistently among the best. Conant joined Campbell with 25 years of experience from three of the world’s leading food companies: General Mills, Kraft and Nabisco. He began his career in 1976 in marketing at General Mills. With Mette Norgaard, Conant co-authored the New York Times bestselling book, TouchPoints: Creating Powerful Leadership Connections in the Smallest of Moments. He is now working on a new book about the secret to driving high performance in an enduring way in an on-demand world. A native of Chicago, Conant earned his B.A. degree from Northwestern University and his M.B.A. from the J.L. Kellogg School of Management at Northwestern. Christopher J. Kearney was named president and CEO of SPX Corporation in December 2004, and added the title of chairman in May 2007. He joined the company in February 1997 as vice president, secretary and general counsel and an officer of the company. Prior to joining SPX he was senior vice president and general counsel of Grimes Aerospace Company, a leading manufacturer of aircraft lighting equipment, engine system components and electronic systems. His business experience also includes positions at Borg-Warner Chemicals as senior attorney and senior counsel at General Electric’s global materials business. Chris Kearney holds an undergraduate degree from the University of Notre Dame and a law degree from DePaul University Law School. Murray D. Martin  Chairman, President and CEO, Pitney Bowes Inc.
Murray. Martin, has full strategic and operational responsibility for Pitney Bowes, the $5.7 billion global leader of integrated mail and document management solutions employing 30,000 people. Under his leadership, Pitney Bowes has produced major technological innovations and executed strategic acquisitions that have transformed the company’s reach and capabilities. Martin was previously the company’s President and Chief Operating Officer (COO), among other executive roles. Martin joined Pitney Bowes in 1987 as President and CEO of Dictaphone Canada Ltd. He was born in Ontario, Canada and attended the University of Waterloo where he received a Distinguished Fellow award from the Center of Applied Cryptographic Research in 2001. William (Bill) Nuti took the helm of NCR Corporation in August 2005, to revolutionize the way people connect, interact and transact with business. Under Bill’s leadership, NCR built the nation’s first retrofitted manufacturing facility to receive LEED® certification for environmental sustainability, bringing hundreds of jobs to the state of Georgia. In 2008, TIME magazine identified Nuti as the thought leader behind the consumer-driven global self-service movement. Prior to joining, Nuti served as president and CEO of Symbol Technologies, Inc., where he returned the company to profitability for the first time in five years, and increased revenue growth by 24 percent from 2002 to 2004. 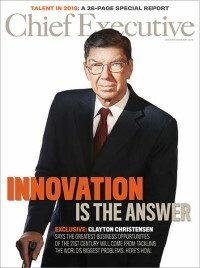 He was the winner of American Business Award’s Best Turnaround Executive. Bill holds a bachelor’s degree in finance and economics from Long Island University. Kurt Schneider  CEO and Director, Harlem Globetrotters International, Inc.
Kurt Schneider has served as Chief Executive Officer of Harlem Globetrotters International, Inc. since May 2007. In 2011 he announced the team’s new office in China to capitalize on the Chinese love of basketball, and emerging “family” entertainment trend. This initiative dovetails with Schneider’s dedicated drive to refresh and reinvent the Globetrotters brand while preserving its basketball innovation heritage. Prior to joining the Harlem Globetrotters organization, Kurt had been Executive Vice President of Marketing of World Wrestling Entertainment Inc. Kurt has two decades of sports marketing and brand development experience including serving as Chief Executive Officer and President of Asimba, Inc. and Vice President of Marketing at Fox Sports Net. He also serves as Director of The Apollo Theater Foundation, Inc. Kurt holds a BA from Dartmouth College. Robert L. Nardelli joined Cerberus as CEO in June 2009. Prior to joining Cerberus, he served as Chairman and Chief Executive Officer and as a member of the Board of Managers of Chrysler, LLC beginning in August 2007. From 2000 to 2007 Nardelli served as Chairman, President and CEO of The Home Depot. Nardelli began his career at GE in 1971, and advanced through a series of leadership positions.